The All Irish Casino is an online casino that has been established to offer casino games specifically to players from the Republic of Ireland. The casino focuses solely on providing the Irish public with the best possible online casino experience. The All Irish Casino offers players from the Republic of Ireland the opportunity to play games of chance supplied by software providers: Net Entertainment, SG Digital, Amatic Industries, Big Time Gaming, Thunderkick, NYX and MicroGaming. The All Irish Casino also offers players the opportunity to play a selection of live casino games broadcast directly from Evolution Gaming. These live dealer games are available 24/7. The Malta Gaming Authority (MGA) has granted the All Irish Casino a license to provide its customers in Ireland with the opportunity to play games of chance and live casino games. The granted license is in compliance with the strict regulations set by the Gaming Authority to operate an online casino. Operating standards are exceptionally high at All Irish Casino as it also has a license from the United Kingdom Gambling Commission (UKGC). Both of these authorities ensure that All Irish Casino is regulated by both the Maltese Government and the Government of the UK. The security at All Irish Casino is impeccable. The casino has several systems in place, as well as state-of-the-art technology, to ensure that players’ data is kept safe. Everything that happens through the All Irish Casino website (including transactions and player handlings) is recorded on a secure server, as encrypted data, as well as on the casino’s secure online systems. The All Irish Casino website is equipped with an SSL certificate, which guarantees players a secure connection. The All Irish Casino is fully committed to honest and safe game play and promises to offer players a fully transparent service. The official payout percentage is generated monthly by the Gaming Authority and is available upon request to players. The casino games are all supported by a proven RNG (Random Number Generator) which means that the outcomes cannot be influenced. The All Irish Casino is in operation to offer players from Ireland the opportunity to play casino games of chance for entertainment purposes only. The All Irish Casino has a specially trained and dedicated team of customer service agents who can assist players with any queries or problems they may have when using the Casino’s facilities. Players reserve the right to set their own gaming limits, to play for free only, and to close their accounts at any time. All personal details collected by the All Irish Casino is for service purposes only and will not be shared with any third parties or used for other commercial purposes. The player’s personal information, game logs, bets and wins and private sensitive details will be secured as encrypted data and stored safely on the All Irish Casino’s server park in Malta. The details are only accessible to the management of the All Irish Casino and its employees. 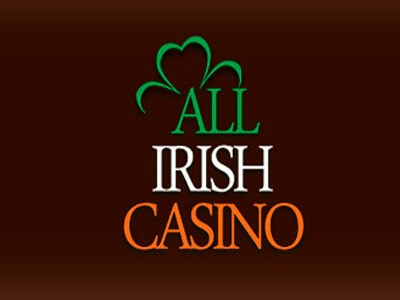 The All Irish Casino is open to customers from Ireland 24 hours a day, 7 days of the week and 365 days a year. The entertaining games that players can enjoy include: Video Slots, Slots, Video Poker, Scratch Cards, Roulette, Blackjack, Caribbean Stud and many other online games. Also available are the live dealer games from Evolution Gaming which are broadcast from casino studios. The live games offered include: Live Roulette, Live Blackjack and Live Baccarat.